This is a very high level view of the architecture of mobile devices, intended to help you better understand how mobile devices work. It isn't a technically detailed overview, and as such, I am not presenting the OSI model as it applies to mobile devices. This is intended to be just-enough to help those interested in implementing mobile learning solutions to better appreciate the underlying technology. In this overview, I use the SmartPhone as an example. Although the SmartPhone is not the only mobile device, it provides a good example in which to describe the technology. To align with convention, I draw the layers with Hardware on the bottom, with the additional layers stacked on top. This is because the hardware layer must be built first, and is the base on which the operating system, and then the applications sit. Camera. Allows the user to record video. Microphone. Allows the user to record audio. Capacitive Touch Screen. Allows the user to interact with the device using touch gestures. Most Smartphones support multi-touch, which allows the device to differentiate between one, two, three, etc points of touch (that is, touching with two fingers at the same time is different then touching with one finger). Accelerometer. Allows the device to determine what angle it is at. This is the hardware that allows the device to determine what angle the device is being held at. One application associated with this hardware is the ability to automatically adjust from portrait to landscape when the device is tilted. GPS (Global Positioning System). Allows the device to determine location using connection to geosynchronous satellites. Most phones use GPS plus Wifi in order to determine a more accurate location. Cellular Antenna. Allows the device to connect to cellular networks for making phone calls and connecting to cellular data. Wifi Antenna. Allows the device to connect to Wifi networks. Operating systems are the base software that run on the hardware platform. Typically operating systems are hardware specific – that is, a specific brand of hardware supports a specific operating system. The operating system defines the basic functionality of the device including how the system boots (or loads) and how the system manages files. The operating system also defines how you interact with the system – that is, it defines how the keyboard works, how the touch screen works, what gestures mean what, etc. In addition, the operating system provides a way for applications to talk to the hardware – that is, that all application use the operating system to access the hardware. Examples of mobile operating systems include: Apple iOS, Android, Windows Mobile OS, and BlackberryOS. Note, that when someone says they have an iPhone, they are talking about the hardware platform. When someone says they have an Android Phone, they are talking about the operating system. The Apple iOS only runs on Apple iPhones. The Android operating system is considered more "open" such that it has been implemented on multiple platforms including: Samsung Galaxy, HTC One, and Amazon Kindle Fire. More information about the different combinations of hardware and software will be discussed in Going Mobile Part 3: Mobile Ecosystems. Applications, or apps, are software programs that run on top of a given operating system. 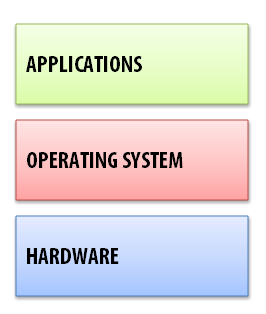 The term "on top" is used because the app uses the operating system in order to access the hardware. Applications provide the value added functionality for the device. The key difference between a Smartphone and a feature phone (the older cell phones) is the Smartphones can run apps, and that the user can load their own apps. More information on the different type of apps will be provided in Going Mobile: Part 4 Apps.